Are you a rule follower, or a rule breaker? We hope your answer is the latter, because state law, federal law, and our own storage unit rules come into play when you store at Modern Storage. To set the standard, let’s review some of the most common allowed items our customers tend to store and unallowable items that can get you into trouble. So many types of items are permitted at Modern Storage under our storage unit rules. From boxes to boats, here are the most common items we can allow in our storage units. Furniture: You are welcome to store any and all furniture here at Modern Storage. Your sofas, chairs, tables, beds, etc. are fair game under our storage unit rules. Fun fact: our customers’ #1 reason for storing with us is to store furniture! If you are moving, or need to store extra furniture, just give us a call and we can prorate your storage unit to coincide with your moving day. Inventory: Businesses of all shapes and sizes need to put their inventory somewhere. If you are lacking space at your workshop, office, or warehouse, Modern Storage has you covered. We are happy to accommodate all types of inventory, whatever your business may need. We even have a conference room you can reserve for a meeting at our West Little Rock location off Chenal Parkway! Vehicles: Need a place to store an extra car, truck, RV, or work vehicle? We have the storage space you need, and our units are competitively priced! Our West Little Rock location currently has parking spots available for vehicles up to 50 feet long. Bins and Boxes: When you’re decluttering your home or office, the first step is usually to put a whole bunch of stuff in bins and boxes. But, then what do you do? All your totes, bins, boxes, and more are permitted under our storage unit rules, so feel free to store them in a safe and secure Modern Storage facility. Decorations: Decorations for holidays, homes, parties, and offices are the perfect types of items to lock away in a storage unit. They take up way too much space, so let us help you find the perfect storage unit to accommodate you. Now that we’ve explained what is allowed at Modern Storage, you should also know what is not allowed under our storage unit rules. Flammables and Explosives: Fires can be devasting, especially so when they happen at a storage facility. We want our tenants’ belongings safe and sound, so we must do everything in our power to prevent fires. Storing flammables and explosives put your unit at risk for starting a building fire that could put our tenants in danger’s way. Please follow our storage unit rules and avoid storing anything flammable in our facilities! Perishables: If an item is perishable (food, flowers, etc. ), this is something you should store in your home and not in our storage facilities. Odorous Materials: A major priority at every Modern Storage location is keeping our buildings very clean and fresh-scented. Please follow our storage unit rules and make sure not to store anything that might cause a bad odor or leak out of your unit. Illegal Materials: We cannot allow any customer to store items that could cause danger to themselves or other tenants. It’s important that every single person can have a happy and safe experience in our self-storage facilities. For a full definition of what constitutes “illegal materials” under our storage unit rules, please ask a member of our staff or revisit your storage unit lease agreement. You: That’s right! You, your family members, employees, etc. cannot live or work in your storage unit under any circumstances. Not only is it unsafe, but it is grounds for immediate termination of your Modern Storage lease agreement as per our storage unit rules. Point blank: people and animals do not belong in storage units. We hope this explains our most important storage unit rules. 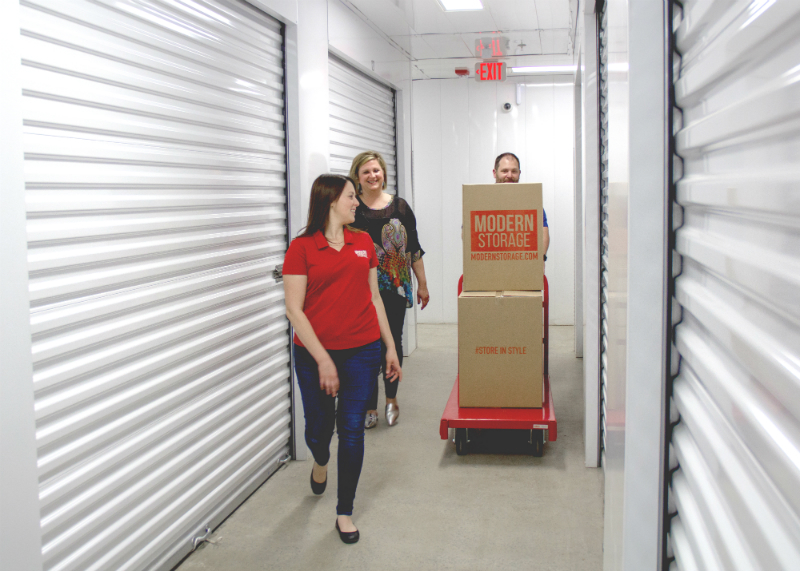 If you have any questions about what you can and cannot store at Modern Storage, please contact us for more information.